We usually can spot out-of-town folks who visit PJ’s for the first time, folks who come here after a long visit at the nearby Metropolitan Museum of Art, for example. It’s easy. Their eyes linger on the colorful and tempting foods in our deli case – piles of fresh fish salads, potato latkes, lox, stuffed cabbages, potato knishes, etc. Their heads swivel as smiling servers whisk by with trays loaded with a dizzying array of meals, including steaming soups with aromas that fill the aisle. 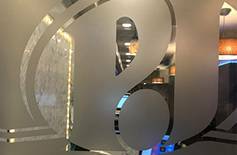 They scan the photographs of celebrities and movie/TV stars who have partaken in the scrumptious selections of authentic, handmade, and traditional Jewish favorites. And sometimes they need assistance working their way through the menu items that may not be all that familiar. How does a kreplach differ from a knish? Our servers explain the difference, may even make a recommendation or two. The menus are substantial because the tastes of our clientele are varied. Old-time Jewish customers may never think of ordering a matzoh ball soup with anything other than consumme. But newer generations and non-Jewish customers may prefer our matzoh soup with noodles. 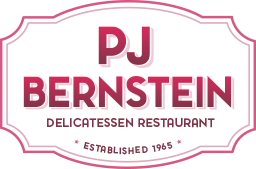 At PJ Bernstein, our menus reflect the traditions of the past, but include new trends in taste.